Sonja (left) and Kaitlyn were even for the first two laps, then SFU stepped on the gas to leave kid behind. 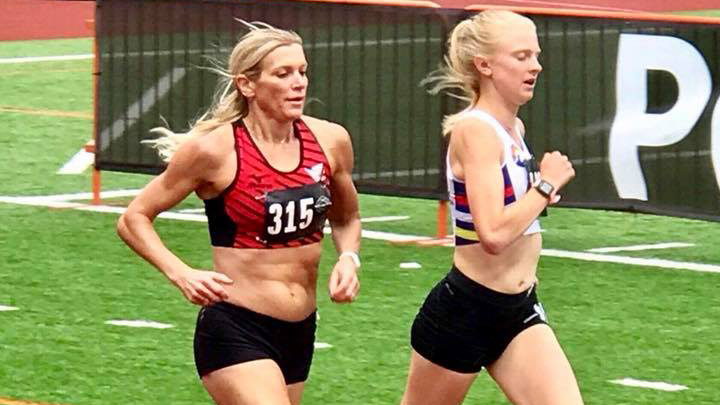 At least three world-class milers mixed it up Sunday at the Portland Track Festival at Lewis & Clark College, with W45 Sonja Friend-Uhl clocking a great 5:07.26. But video doesn’t reflect the results, which don’t list W50 Marilyn Arsenault of Canada and Kaitlyn Barthell (who ran stride-for-stride with Sonja the first two laps). Later, I learned that Kaitlyn, in her 20s, and Marilyn were entered as open runners, with times listed elsewhere. W50 Aeron Arlin Genet was credited with a great 5:19.84. But also impressive was W60 Lesley Hinz, fifth in 5:47.16. That’s less than 5 seconds off the listed WR of 5:42.65 by Kathy Martin in 2013. Aeron’s mile was 6 seconds off Kathy’s W50 American record. In the masters men’s mile, M40 Joshua Gordon scorched a last lap of 63.9 to win in 4:39.55. See results here. Be the first to comment on "Sonja Friend-Uhl takes Portland mile, but W60 Lesley Hinz has top mark"